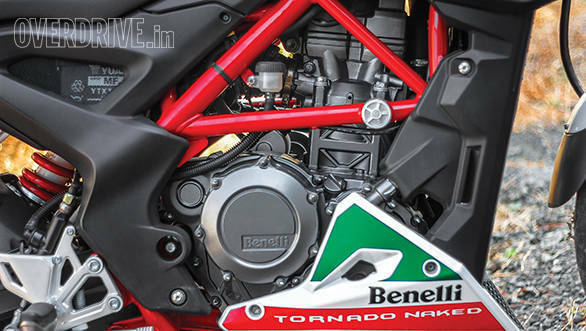 In 2014, the label of being the smallest Benelli did not belong to the TNT 300 anymore. It was at EICMA in Milan two years ago that we first saw the BN251. We always knew that it would make its way to India. We just didn't know when. 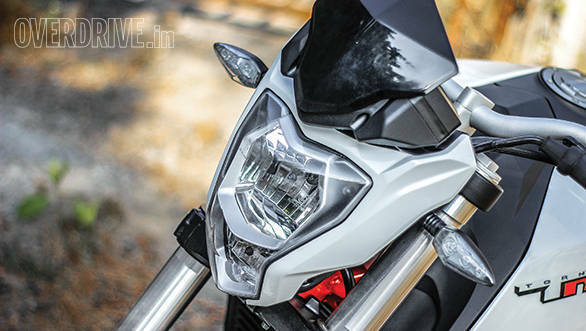 We've waited to see the motorcycle in the flesh and what got us even more excited is that with the spec that it came with, it would be a worthy competitor to the KTM 200 Duke. Almost a year later, the BN251 has finally arrived. Only, in India, it is being called the TNT 25. Does it live up to our expectations? The TNT25 is a nice looking motorcycle. 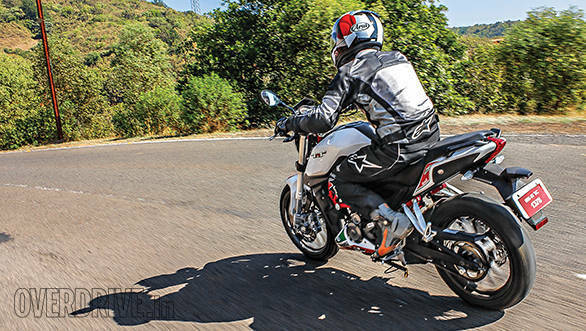 A lot of the styling cues follow the same direction as the KTM 200 Duke. It is minimalistic and aggressive with its flat handlebars, slash-cut tank and exposed trellis frame. I do wish that the front end had more distinctive styling. To me, it looks too similar to the Duke and had it been inspired by the TNT triples, it would have made for a much more distinctive style. The fit and finish levels are excellent and the while the test bike we got our hands on was a little worse for wear (and hence rattling a fair bit), I'm pretty sure that a well taken care of TNT 25 wouldn't show any undue signs of ageing. It is a roomy bike and the riding position, while sporty, isn't too aggressive. The seat is comfortable too and doesn't lead to any aches and strains after long runs in the saddle. There is one thing about the TNT that I really like and that is the whole bunch of accessories that are already available for it. Everything from adjustable levers to replacement caps for the oil filler, brake reservoir and even gold race foot pegs. 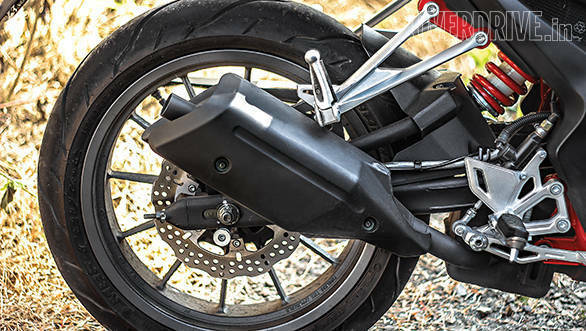 There is also an entire line of fork, frame and swing-arm sliders. Let's get the numbers out of the way first. 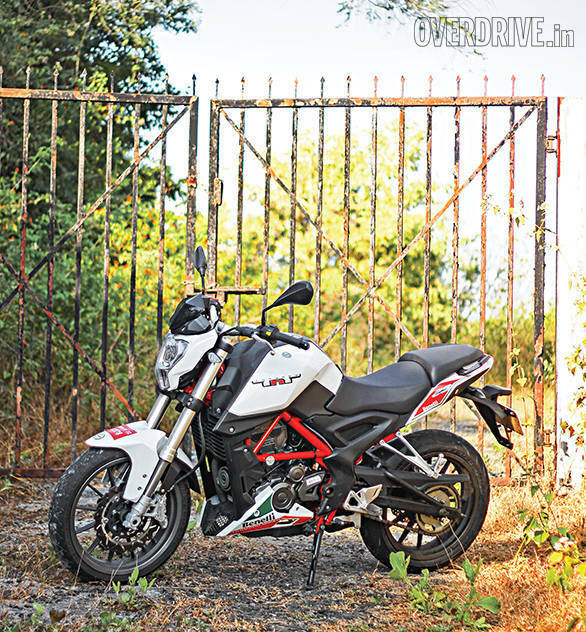 The little Benelli uses a 249cc, liquid cooled, single cylinder engine to make its 28.6PS and 21.6Nm. This is mated to a 6-speed gearbox. But how does the engine actually feel when you're riding? Not very nice. It is a very unrefined engine and is vibey right from idle. The more you rev it, the more vibes you feel. Foot pegs, seat and handlebars  it is a three pronged attack that leaves your limbs buzzing even after stepping off the motorcycle. There is an upside to the harshness though. The TNT 25 is a deceptively quick motorcycle. When you're actually riding it, you get a feeling that the motorcycle isn't really all that eager to go fast. But when you actually time your acceleration runs, you will realise that the Benelli is actually quite a quick little number. It clocks 100kmph in 8 seconds, which is mighty quick even when you compare it to its close ratio 'box equipped competition. It isn't slow either, with a top speed of 138kmph. That said, we do wish that it had a taller sixth gear. With the refinement situation being what it is, you end up cruising at 100kmph with engine ticking away at around 7,000rpm on an engine that redlines at 10,000rpm. A taller sixth gear would've made cruising at high speeds a bit more bearable. 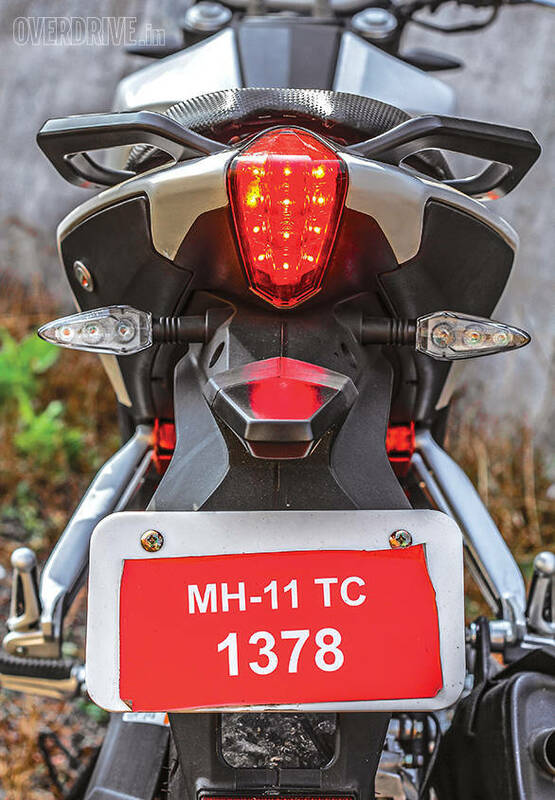 The LED tail lights look similar to the Scooty Zest! As far as fuel efficiency goes, the TNT 25 returned 28.8kmpl in the city and 35.6kmpl out on the highway. That is in our standard fuel efficiency testing. But what is impressive is that in real world riding conditions, we could finish a 300km run with just over half a tank of gas. This included mostly highway riding at high speeds. Not bad. Like most of the other TNTs, the 25 too uses a Trellis frame with upside down forks up front and a single hydraulic shock absorber at the rear. The suspension is set up quite stiff, and the ride can get a bit bumpy over bad sections of tarmac. But, it isn't upsetting or uncomfortable, even over potholes. 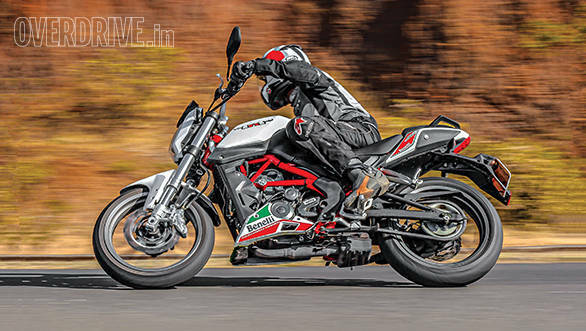 The Benelli isn't a very quick steering motorcycle, but neither is it lazy when thrown into corners. It is a very neutral handler and can hold its line pretty well. We did notice that when subjected to mid-corner bumps or sharp bumps in a straight line, the chassis did tend to do a little weave. In most motorcycles, this weave is disposed of within two to three oscillations of the chassis. In the TNT though, this took up to ten, which took away a lot of your confidence in pushing the motorcycle hard and made it feel like a motorcycle that is teetering on the edge of stability. That said, we are willing to overlook this little niggle and give Benelli the benefit of the doubt (the test bike we got was a bit worse for wear). Also, since the weave never got aggravated to dangerous levels, like turning into a full blown tankslapper, we're willing to let this slide. Our advice  if you are in the market for a TNT, make sure you take it out for a test ride and keep an eye out for that weave and see how comfortable you are with it. The little Benelli is actually quite a nice motorcycle. It might not be the most exciting thing in the market today, but it does pretty much everything it sets out to do pretty well. It is smart looking, has a punchy motor, is efficient and can handle its own in corners. The only real problem we have with it is that the engine really feels like it is off a tractor. So if you can live with that, it makes for a motorcycle that, among other things, will make you stand out amongst the predominantly orange crowd. If you are willing to foot the Rs 2.13 lakh (on-road, Mumbai) price tag. If you do want one, we strongly suggest that you spend the extra Rs 4,000 and get the Premium variant that gives you Metzeler rubber. It enhances the capabilities of the motorcycle a fair bit for very little money.